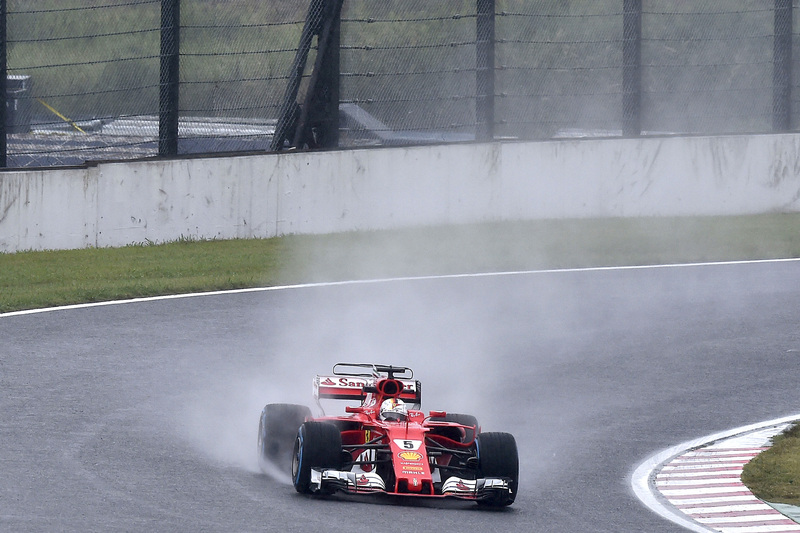 Sebastian Vettel set the practice pace on Friday at the Japanese Grand Prix, but lashings of heavy rain in the afternoon prevented most cars from taking to the track during the second session. The Suzuka Circuit was unusually busy for free practice one because forecasts pointed to the imminent arrival of wet weather, which was due to persist through the day and into final practice on Saturday morning. The 10 constructors attempted to compress three days of data gathering into a single 90-minute session, knowing that qualifying and the race are likely to be dry, and it was Ferrari’s Sebastian Vettel that emerged with the fastest time. The German’s quickest lap of 1 minute 29.166 seconds was 0.211 seconds quicker the title leader Lewis Hamilton’s best effort in his Mercedes, providing early encouragement to the Italian team desperate to rebound from a string of three troubled grands prix. More positive still is that Vettel’s final sector was 0.2 seconds slower than Hamilton’s, suggesting there could yet be more time in the bag for the red team. Vettel’s soft-tyre pace, similar to that exhibited by Hamilton on the supersoft tyre despite Mercedes running both cars with upgraded aerodynamic packages, was also cause for Silver Arrows concern, albeit early in the weekend. “I think it was a decent morning,” he said. “We tried to do a lot of things, but it was good to run and get a feel. The German, however, cautioned that the weather forecast could yet undo Ferrari’s plans to resume the winner’s step. “If it’s wet then we need to improve,” he said. “Obviously the last time it was wet it was Monza and we were not very strong. “I think Malaysia was a bit better, but I hope that we learnt our lessons and the car should be competitive. Vettel must reduce his 34-point deficit to Hamilton’s championship lead to at most 28 points to keep his title hopes in his hands; any greater and Hamilton could make it to the end of the season without winning another race. The German reiterated that he had faith in the car to deliver the goods. “Obviously the results were not the best over the last couple of races, but I think we are strong and I think we have all reasons to be confident. Lewis Hamilton was upbeat about his performance, noting that his car feels much improved compared to its lacklustre performance in the previous two races. “It’s been an interesting day,” he said. “The car is feeling much better than it was in Malaysia. Daniel Ricciardo finished third and 0.15 seconds behind Hamilton’s time, but admitted his Red Bull Racing team needed to find a better compromise between cornering speed and straight-line speed to compete with Ferrari and Mercedes. “It was okay in the dry,” he said. “Our pace was pretty good. Ferrari’s Kimi Raikkonen was a further tenth behind Daniel Ricciardo, but Mercedes’s Valtteri Bottas and Red Bull Racing’s Max Verstappen were one second and 1.5 seconds off the headline pace in fifth and sixth. Esteban Ocon headed a tightly packed midfield separated by 0.3 seconds and comprising Renault’s Nico Hulkenberg, Haas’s Romain Grosjean, McLaren’s Stoffel Vandoorne and Kevin Magnussen in the second Haas car. With cars already lapping 1.5 seconds faster than last year’s pole position time, drivers wre testing the boundaries with their improved 2017 cars, btu the only incident of note was a crash by Carlos Sainz late in the session. Rain began to fall in the dying moments of the first session and remained unabated in the afternoon. Drains around the circuit bubbled over with the sheer volume of water streaming across the road, forcing a 45-minute delay to the start of the second session. By the time the second session started the likelihood of wet qualifying outweighed by the risk of having to repair a car damaged in the treacherous weather for most. Only five car bravely ventured out into the wet conditions to set a lap time, including Hamilton, who set the fastest time.